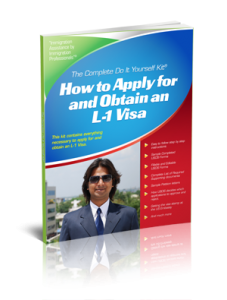 This complete Do-it-Yourself kit includes everything you need to obtain the L-1 Visa for Intracompany Transferees. This downloadable kit is in .pdf format and can be viewed and printed using Adobe Acrobat Reader. Click here to download your free version of Adobe Acrobat Reader. This downloadable kit contains fillable and editable USCIS Forms. You will be able to complete your USCIS forms on your computer, then print them out to use with your petition to the USCIS. An explanation of how USCIS determines which applications they accept and reject. The correct USCIS address to send your application to depending on what State the job is in. The current USCIS fees to submit with your application. The correct USCIS telephone number to call to check on your application depending on what State you live in. Sample Cover Letter to USCIS: Detailing the beneficiary’s proposed job duties and foreign company – U.S. company relationship. Special Supplement – How to file your L-1 Visa Petition through the Premium Processing Service. We accept MasterCard, Visa, Discover, American Express, and Paypal. Your kit is downloaded as a zip file. Once downloaded, please open (doubleclick) the zip folder and in it you will see your Kit in .pdf format. Your Kit can be viewed and printed using Adobe Reader or Acrobat. Click here to download your free version of Adobe Reader.